As I write this, I've tried to stop keeping ice cream in my house because as you can probably tell from this blog, I eat a lot of it and have kind of gotten out of control. Still, despite my best efforts, I occasionally break down and see a good deal in the store or see a new flavor that piques my curiosity and I trick myself into picking a container up. 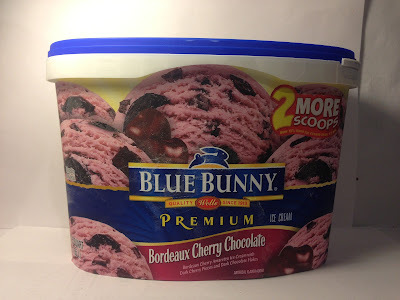 That was the case with this Blue Bunny Bordeaux Cherry Chocolate Ice Cream that I saw at Kroger for the unreal sale price of $2.99 (I also had a $1.00 coupon via their Kroger iPhone app, so what a deal!). The container is a little bit larger than usual 1.75 quarts (two extra scoops) and each half-cup serving has 160 calories. Being that this does have those two extra scoops, there's about fourteen servings per container. I've tried Blue Bunny before and I'm certainly hoping this flavor turns out to be less boring than the last. In lieu of describing it myself, I'll still the product description straight from Blue Bunny's website, "Experience the delicious dark side of cherries and chocolate. Dark cherry pieces and dark chocolate flakes swirling in creamy Bordeaux cherry ice cream for a taste sensation that's wickedly good." Wow, that's quite a glowing description, wouldn't you say? 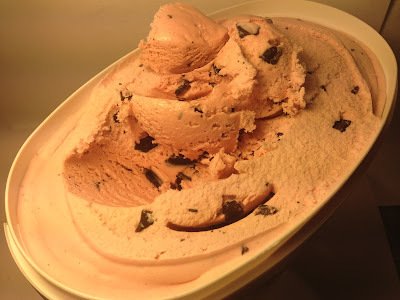 Anyway, in terms of the container itself, you could definitely smell the cherries as soon as the container was opened as the ice cream has a nice and quite strong cherry smell. 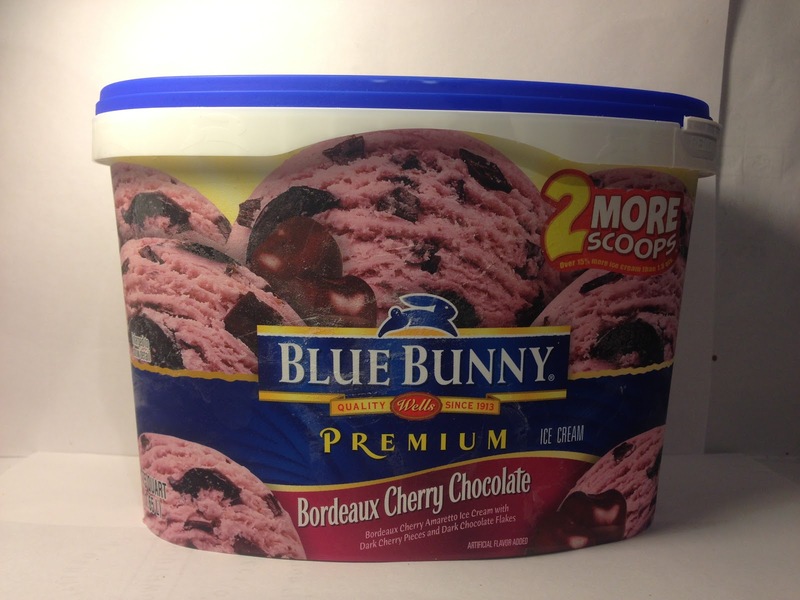 When I dug my spoon in to investigate, I also several large, popped dark cherries spread throughout the container, so one thing was for certain and that was that I was not going to get shorted on cherry flavor. I wasn't going to get shorted on the dark chocolate either as there were many dark chocolate chunks spread throughout, so in terms of add-ins, I commend Blue Bunny for their commitment to excellence here. That smell was no different when it came to taste too because this was all cherry, all the time. It was more of a sweet cherry and there was no real tang or tartness at all. It was quite a lot of cherry flavor though, so you do need to be prepared for that. The dark chocolate did add some hearty, although not sweet, flavor since it is in fact dark chocolate. One thing that was nice about those chocolate chunks though was that they were hard and brought some crunch to the each serving, which was nice because on when I was able to encounter a cherry, it was a soft and almost juicy pop in my mouth. Having that crunch to break up the sweet juiciness of the cherries was a very welcome and key addition so that this one did not get boring in your mouth. Buy It or Fly By It? This is a toughie, much like the last Blue Bunny review I did. While there was certainly nothing wrong with this, nothing about this ice cream left me overly impressed. It was a whole lot of cherry flavor with some dark chocolate added in. Frankly, it was mostly boring, but despite that, the flavor was nice so I supposed I'll give it a BUY IT rating. There are better flavors out there from other manufacturers and unless you are really craving something cherry flavored, it's probably better just to pass this one up. I will say this though, after two Blue Bunny reviews, consider me unimpressed. Both have been okay flavors, but boring. Nothing about them really impresses me to any degree. Oh, my gosh! I completely disagree. I think their cherry bordeaux is absolutely wonderful! and my kids found it and ate it all in spite of there being several of their own favorites available. I love this ice cream but lately I can't find it. Is it discontinued? I'm only finding frozen yogurt. They changed the name to Cherry Pickin' Chocolate.